Nana Kobina Nketia, the Omahene of Essikado Traditional Area, has tasked the Ministry of Education as well as educational institutions to teach with books written by Ghanaians. According to him, teaching with books authored by Ghanaians in our universities and other institutions would change the way we think as a people. Nana Kobina Nketia, who was speaking in Accra at the launch of the Minister of Education, Prof Naana Jane Opoku-Agyemang’s book titled ‘Who Told the Most Incredible Story’, said books authored by Ghanaians on Ghanaian culture, values, and morals tell the story of Ghanaians as a people and must be encouraged across the country. “About 99 or 95 percent of the books that we use come from a particular culture; and at the end of the day, the books affect our minds. One of the things some of us believe in is that there are a whole literature out there that if we stock our universities and other institutions with, they will make a change in the way we think,” Nana Nketia stated. The book, which was published by Afram Publications Company Limited, comes in five volumes and contains 45 Ghanaian tales that teach various morals. 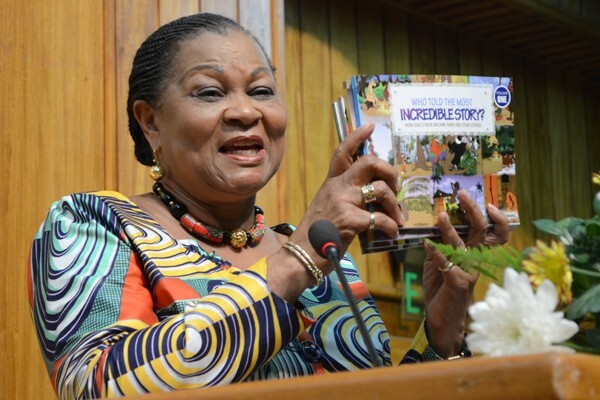 Prof Naana Jane Opoku-Agyemang said she put together the book to emphasise the need for Ghanaians to read stories that come from their own tradition in order to preserve our identity as a people. “Some of us sometimes boast that our children cannot speak our local dialect. We shouldn’t pride ourselves with that. They have to learn the English but they also have to learn their local languages as well. By learning to speak your language, you get to understand who you are, where you are from and how certain things are done. “Our tales will remain relevant insofar as the values for respect for others and the environment , of sharing ,placing others’ interests above our own , of consideration for diverging views, of tolerance, empowering the underprivileged so they don’t forever remain so…. As far as all these remain, regardless the passage of time, so will our tales be,” she said. She urged Ghanaians to start documenting local stories by writing them into books so that they do not get lost. “Education is about the quality of thinking and the quality of the imagination. The objectives for writing this book are many but the most important one is to provide a way in which all members of the family, or if a group, can share time and entertain each other and learn as well,” she added. The event was graced by various personalities like Dr Joyce Aryee, Tsatsu Tsikata, Audrey Gadzekpo and Prof Kwabena Nketia among others.